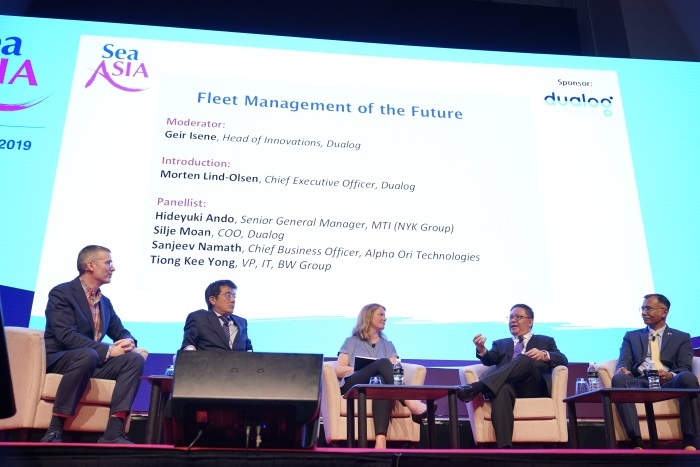 Left to right: Geir Isene, Head of Innovations at Dualog, Hideyuki Ando, Senior General Manager at MTI (NYK Group), Silje Moan, Chief Operating Officer at Dualog, Sanjeev Namath, Chief Business Officer at Alpha Ori Technologies, and Tiong Kee Yong, Vice President, IT at BW Group. Chaired by Esben Poulsson, Chairman of International Chamber of Shipping and President, Singapore Shipping Association, the debate covered regulatory areas of water management, fuel regulations, and decarbonisation and how these impact all players in the maritime space. Arguing for the motion were Dr George Pateras, President of Hellenic Chamber of Shipping and Hellenic Maritime Cluster, and Deputy Chairman of Contships Management Inc.; Friedrich Bunnemann, Managing Partner of Asiatic Lloyd Maritime LLP. ; and, Ali Shehab, Deputy CEO Fleet Operations at Kuwait Oil Tanker Company (KOTC). Arguing against the motion were Dr Sadan Kaptanoglu, President Designate of BIMCO, and Managing Director of HI Kaptanoglu Shipping; Professor Christine Loh, Chief Development Strategist at The Hong Kong University of Science and Technology; and, Jeremy Nixon, Chief Executive Officer at Ocean Network Express (ONE). The debate was a lively, fulsome and frank exchange with the speakers arguing for the motion pointing to the progress the maritime industry has already made to move towards more environmentally-friendly and sustainable operations. This includes their commitment to the IMO 2050 target to reduce greenhouse gas emissions by 50 per cent by 2050. This is despite the industry only contributing to a small portion of the world’s carbon pollution. Having already made several steps in the right direction, they argue that it is time for us to turn our attention to other industries that are notably worse polluters. On the IMO 2020 regulations, they cited the significant investment companies are required to make in order to reach a level of compliance, and the operational challenges this has created. They argue that despite the investment, there is no guarantee that oil refineries can meet the level of alternative fuels required for the indsutry to operate. The maritime industry therefore, urges for a commitment from large oil suppliers, such as BP and Shell, to ensure that the investments in ships are not wasted. Ultimately, they said that in the future any IMO regulations need to be helpful for the industry to achieve sustainable operations, and not become policies which are difficult to meet. Arguing against the motion, the speakers recognised that while the industry has taken some steps towards a greener future, there is still more to be done to secure a social licence to operate. Industry leaders are required to work together to find ways to meet the expectations of consumers and customers alike for a more sustainable shipping industry. They view the opposition’s position on needing other industries to take more decisive action, as well as their call for a greater commitment from oil companies, as excuses to not do more. They argue that the industry needs to be a leader and set in motion demonstrable actions to create change. One way to do this is for all players to work together, including international bodies, ship builders, scientists as well as governments and R&D funders, to find workable solutions that will really make a difference to the environment. They argue that the industry needs to look beyond IMO 2020, and at how they can reduce carbon footprint in the next 20 to 30 years to create a more sustainable industry, as well as a safer ocean environment. Ultimately, the parties agreed on one thing – the sustainability of our oceans, and the environment more broadly, is imperative in ensuring the viability of the shipping industry. Following an audience vote, the team arguing against the motion won the debate.